What is considered a jumbo loan? The short answer is any mortgage amount the exceeds the conforming loan limit. For most of the nation, the current conventional loan limit is set at $484,350 for a standard one-unit property. Other locations deemed “high-cost” like parts of California, Florida, Colorado, Virginia, have higher conforming loan limits up to $726,525. Buyers can see the conforming loan limit chart here. Both conforming and jumbo loan guidelines are pretty much the same with some minor differences. Jumbo loans will require a higher credit score than conforming loans and the interest rates can be slightly higher do the greater risk associated with these loans. This is why some buyers prefer to make a larger down payment for a higher end home in order to fall at or below the conforming limit. So where did the conforming limits come from? Years ago it was Fannie Mae who set new loan limits, and when Fannie adjusted so did Freddie Mac. Both have the same loan limits. Buyers can read the complete Jumbo Mortgage Guide here. The most recent Congressional action regarding loan limits was enacted in 2008 with the introduction of the Housing and Economic Recovery Act, or HERA. HERA created the Federal Housing Finance Agency and for the first time in history, federal guidelines were codified and an official method to set future conforming loan limits was set. As conforming loan limits rise, so too will the definition of a jumbo loan. 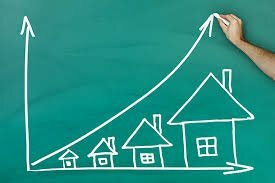 For example, from October of 2017 to October of 2018, the national average price for a home increased again based upon the House Price Report or HPI. The Federal Housing Finance Agency then increased the conforming loan limit for 2019 $484,350. Subsequently, anything above $484,350 is a jumbo loan. Or is it? There are areas in the country where home values are higher than in other metropolitan areas. These high cost areas are located in larger metropolitan areas. But are home buyers in these locations at a disadvantage because home values are much higher? Do they have no choice but to buy a home in a high-cost area and take out a jumbo loan when a similar size home in other areas would be considered a conforming? There is a middle ground. HERA has identified high-cost areas. These are metropolitan areas where the local median home value exceeds 115% of the conforming loan limit and lending guidelines have been established for such homes that are not exactly like a conforming loan but also not a jumbo mortgage. In most of these “high cost” areas, the loan limit is bumped up to $726,525. There is also a method for this calculation. High-cost loan limits are set at 150% of the conforming limit of $484,350. What are some areas where the loan limits hit the high-cost guideline? Fannie and Freddie refer to these loans as “high balance” programs. In San Diego, the high balance loan limit is $649,750 while just up the road to Los Angeles the conforming high balance loan limit is $726,525. Note, loan limits are set by County, not by the city. Also note, these values refer to single family homes. Multi-unit properties up to four units will have higher loan limits and still be considered conforming. For example, a four-unit property can as high as $871,450 and still be eligible for a conforming rate. Again, for a four-unit property, anything above this amount will either be a high balance or jumbo product. In high-cost areas, the maximum conforming limit for a four unit home is $1,307,175. From lowest to highest, conforming rates are the lowest, then high balance conforming and then jumbo. For many, buyers choose to finance a jumbo loan with two mortgages instead of one. Why would someone take out two loans? Because it takes less cash to close with two loans. Most jumbo loan programs require a down payment of at least 20-25% but with two loans instead of one. The down payments can be as low as 5% for well-qualified buyers. Home buyers can read the complete Jumbo Purchase requirements here. Closing costs for jumbo loans are pretty much the same with a conforming program. With larger jumbo loan amounts however, there may be two separate appraisals needed instead of just one and of course with a larger loan amount there will be a larger title insurance premium, but other than that you can expect closing costs to be close to their conforming cousins. One “closing cost” that also can’t be ignored really isn’t a cost and it’s called cash reserves. Cash reserves are available funds left over in a buyer’s account after the closing has taken place. Cash reserves are identified as how many months of mortgage payments are in the bank. The mortgage payment includes not just the principal and interest payment but also an amount for taxes and insurance. A jumbo mortgage will typically ask for 3-18 months of mortgage payments be available to the buyers after closing. If for example, the total mortgage payment for a jumbo loan is $4,500 and the cash reserve requirement is 12 months, there needs to be an additional $54,000 in a borrower’s account. 12 months of cash reserves is also a trademark of a jumbo loan. Note – the exact amount of reserves will depend on many factors like loan amount, down payment, credit score, etc.